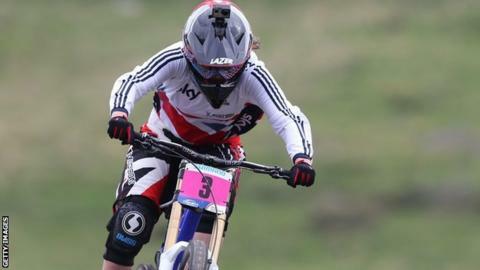 Wales' Manon Carpenter finished as runner-up overall in the downhill mountain bike World Cup series after claiming third place in the final race. Rachel Atherton, who had already clinched the title, secured her sixth successive race win in Italy. The English rider beat France's Myriam Nicole into second to claim the 26th World Cup win of her career. Carpenter needed a strong end to the season after disqualification and crashes had ruined her title hopes. The 2014 World Cup champion will now join Atherton, and third-placed Tahnee Seagrave, in the Great Britain team at the World Championships are held in Andorra in September.